Everyone knows my addiction to Pinterest. Well, if you don't then just know, I have a huge addiction. I love that site. I am very visual and so I love being able to see my bookmarks in picture form. That said, I am participating in a little Pinterest Challenge with one of my moms forum. We are supposed to select one thing we have pinned and in a week, complete it. I have probably well over 1,000 pins. WELL over 1,000. I have only done a few of the ideas, but I am trying really hard to follow through with more of them. I am doing really well by trying out some of the recipes that I have pinned. I saw this pin yesterday and after looking at the ingredients, I realized I had everything to make this, so Lucy and I set out. The first batch went ok. I tried to line the glass pan with wax paper then pour piping hot caramel into it. Then I put it in the freezer to chill it. Well it cooled but the wax paper stuck to it so now if you break off a piece, you get wax paper too. Then, we made another batch. This one I just sprayed the glass pan so that the candy wouldn't stick. Then we threw it in the freezer. And I left it in the freezer to long. It froze solid. Ugh. Well I let it sit on the counter for a bit to soften up then I took my pizza cutter and sliced it into pieces. It's sooooooooooooo chewy so I tried to cut it into small pieces. It was sooooooooo hard to cut. But I got through half of it and then individually wrapped each piece in wax paper. It was good. It's very rich and so super chewy but it was good. I think once I get all of it cut up I am going to keep them in the freezer until we want to eat them. 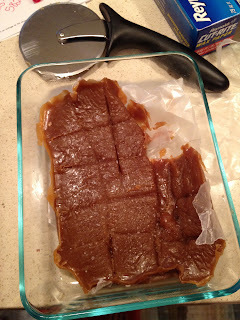 I don't know what I am going to do with the batch that stuck to the wax paper. Either way it was good. I really like that it is an easy sweet treat. But it is a little greasy because the butter, but still yummy! 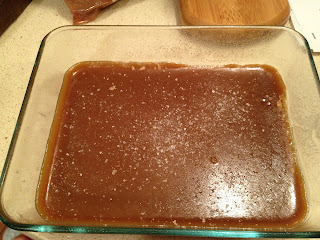 Oh and I added some sea salt on the top so it was a salted caramel.